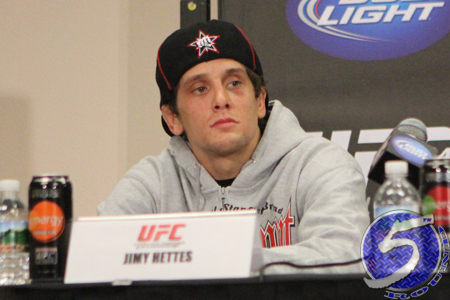 You wouldn’t know it by looking at his unassuming baby face, but Jim Hettes (Pictured) is a fast-rising mixed martial arts superstar. “The Kid” utterly destroyed Nam Phan on Friday night at UFC 141 to bump his record to a perfect 10-0. While UFC security has yet to realize he’s one of their athletes and not a fan trying to sneak backstage, company president Dana White has finally taken notice. “I’m gonna be honest with you, [Friday] was really the first night that I noticed this kid,” White stated at the post-fight presser. “It’s pretty awesome to see a jiu jitsu kid who punches – when something doesn’t work he moves to something else. With stardom at his doorstep, the 24-year-old talked to us about remaining humble, his relationship with UFC legend Tito Ortiz and how lightweight champ Frankie Edgar has influenced his career.